Update: Cranberry Style is out - it only lasted a week before I started to hate it. Now it is this orange/purple Power Style (lets see how that goes...). 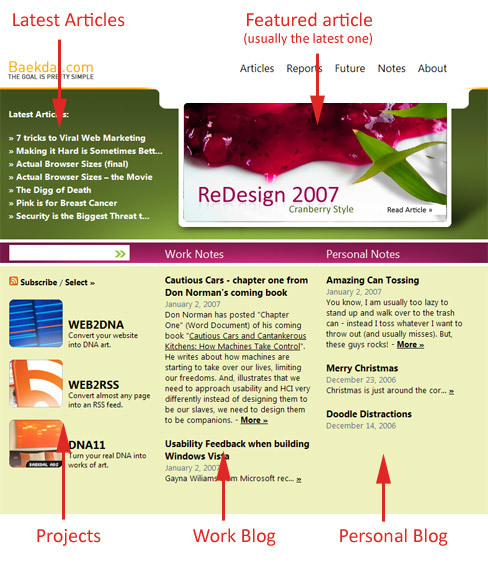 Welcome to Baekdal.com - 2007. It is much the same as in 2006, but with a twist. I have added some of the things that you, my readers, wanted. I am simplifying the publication process (work in progress), and I have added a blog. This design is my new 2007 layout - called "Cranberry Style". It is much lighter than the previous one, but still using an unusual color tone inspired by cranberries. The size for the Content hasn't changed, but the overall width of the site has expanded a few pixels. Some people might question this, especially since I recently published my report on "Actual Browser Sizes". But, this new layout covers 95% of my visitors (based on the data I collected a few months back). And, the front page is completely redesigned (based on reader feedback). Many people have recommended that I should create a blog, much to my surprise as I already considered my site to be a blog. But, I see the point. There are many times when I want to publish something, not suitable for article. I have created 2 blogs (called Notes just to be strange). One is for work related topics (Work Notes), the other is just for fun (Personal Notes). The latest 10 post will be featured on the front page, the rest under "Notes". Another request from readers was a more flexible RSS system. Some people might not want to subscribe to everything. I have changed the RSS system, so you subscribe to "all the content" or just to one or more sections - of your choosing. The main RSS Feed (the old one) now includes everything. I have made several changed besides the big visual stuff. Everything from how the databases is used, to changes to CMS, the search box, navigation feedback, comments count, WYSIWYG conversions etc. All of which should make Baekdal.com more enjoyable for all of us. I hope you like it - and welcome to Baekdal.com 2007.